Launch parties for albums are, by design, rambunctious affairs - they are parties, after all. The launch for the rapper Ghostpoet’s debut album last week followed in this tradition, with a shambolic but no less entertaining gig to herald his new LP. 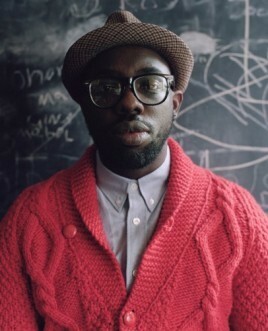 Ghostpoet, known to his mum as Obaro Ejimiwethe, hails from Birmingham but moved to London to make his fortune - a fortune which seems all but inevitable. His esoteric brand of chilled, jazzy rapping over a mellow hip-hop backdrop caught the attention of Giles Peterson, who gave him both the oxygen of publicity on his Radio 1 show and a contract with Peterson’s Brownswood record label. With first single ‘Cash & Carry Me Home’ getting decent airplay, Ghostpoet’s star has been steadily rising, leading to this album launch at Islington’s Electrowerkz selling out quickly (and forcing promoters Soundcrash to hastily book another gig). Occasionally the evening felt a little chaotic: for some reason, the bouncers refused to let people into the main room before the headline act, leading to a crush by the bar. And the venue, usually host to dingy club nights, evidently did not have any kind of backstage, which meant the star attraction was forced to shuffle apologetically through the waiting crowd. When guest musicians were required onstage, Ghostpoet had to gingerly call their name down the mic and wait for them to arrive, or enlist the audience to bellow in unison. Sergio the cellist must have had his name ringing in his ears. But the man everyone came to see was on fine form. Looking dapper in trademark trilby, thick-rimmed glasses and grey jacket, Ghostpoet held impressive sway over the crowd, auspiciously absent of the arrogance or aggressive posturing typically found with his hip-hop/grime brethren. The MC was a perfect gentlemen, effusively grateful throughout for all his support, lapping up the warm response he received and even giving a rather sweet ‘thank you’ speech at the end. His transition from studio to stage was relatively sucessful. Hip-hop has always had a problematic relationship with performance, and purists might argue this was not a truly live experience - a backing track accompanied the set, making the live performers occasionally feel like musical window dressing. But the drummer gave the hour of chilled hip hop a stomping edge, and amply complemented Ejimiwethe’s bluesy lyrics, whose delivery, whilst needing a little bit of polish was nonetheless confident and slick. Drily observant and drawing wide influences from grime, jazz and ambient, this was a promising debut from a future star.